One area of your wedding that you do not want to take for granted is your choice of a wedding officiant. It is actually one of the most important elements of your wedding. It is the officiant that will set the tone of the ceremony. It is always awkward if it seems like the officiant and the couple getting married just met. Experience also plays a huge role in whether your officiant can make events go smoothly or they seem disjointed. Keep in mind that you have and are putting a lot of effort into all of your other wedding plans, so don't give this choice short shrift. Think about what you are going to be saying at the ceremony and then you will realize that this is a very important decision. The Atlanta area has numerous qualified individuals that can help you. Here we have provided just a few things to think about before you make your choice. So, where do you start? Well, if you want to have a religious wedding, do you have a house of worship that you presently attend? If you do, your choice may be made for you. You should go to the minister and ask to meet to discuss the possibility of having your wedding where you attend and having them be the officiant. If you do not attend anywhere, you can start looking for denominations that have your beliefs or at least as close to your beliefs as you can get. 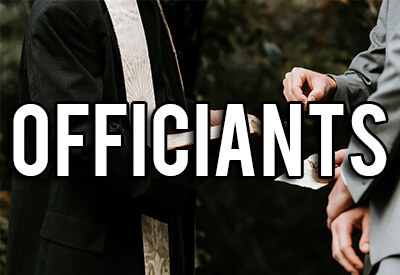 If you and your fiance have different belief systems, there are interfaith officiants who could perform your ceremony. You can find these online. Of course, if you do not want a religious wedding, there are other routes you can take. You can actually have a friend or relative marry you. They can obtain the right to do so online. A lot of people like this idea because of its personal nature. Of course, you can always seek out a justice of the peace. The first question you want to ask any potential officiant is whether they have your wedding date open on their calendar. Also, keep in mind that if you are having a religious ceremony, some clergy will not preside over your wedding unless it is in a house of worship. Find out about this. In addition, a lot of houses of worship have rules about what is and what is not permitted within the confines of those walls. If one of these rules is unacceptable to you, you will want to move onto your next candidate. Do you care if a man or a woman presides over your wedding? Find out if you need to attend counseling sessions for certain candidates to agree to marry you. In terms of the actual ceremony and the chain of events, talk about what you and your fiance would like to have said at the ceremony other than the normal statements. Talk this over with any potential candidates. You also want to talk about the list of activities that will happen at the ceremony. Go over every little detail. Do you want a unity candle portion for instance. Do you both want to say your own vows? Will the officiant help you in writing your vows? Ask them for suggestions if you are looking for them. How much will this service cost? Just to give you an idea, normally the fee will be in the area of $300 to $600. Ask each candidate if they require a deposit to reserve their services. And in the end, go with someone that you feel comfortable with and the one that will convey to you and your guests what matters to you most. Rev. Dr. Barbara Roberts is a non-denominational wedding officiant who believes couples should have a ceremony designed to their Spiritual preference. To that end, on her website, she has ready-made ceremonies and the different parts that make up a ceremony - the couple can mix and match them as they see fit. All You Need is Love is my belief for a wedding. Catering mostly to the LGBT community, she is all inclusive with the couples she works with. She honors all beliefs and philosophies from spiritual to secular.